This is end of life hardware, if you wish to get one you probably have to buy them used. 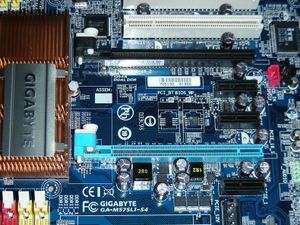 However, the unique with this board is that it has high Coreboot Vendor Cooperation Score (VCS) and ECC memory support that mainly are used for servers. 1 Which board do you have? The GIGABYTE GA-M57SLI-S4 seems to exist in 3 versions according to the link in https://github.com/coreboot/coreboot/blob/master/src/mainboard/gigabyte/m57sli/board_info.txt. revision 1.0, and 1.1, are supplied with PLCC32 (soldered BIOS) and revision 2.0 with single 8 pin SOIC (SPI). All board revisions have unpopulated secondary pads. For the PLCC32 versions, the procedure outlined below can be used to add a ROM socket. There is a version with a PLCC socket for the BIOS chip (socketed BIOS), but this might be a pre-production board since nobody has so far (2007/03) confirmed the purchase of a GA-M57SLI-S4 board with socketed BIOS. The mainboard photo on the backside of the GA-M57SLI-S4 box shows a ROM socket too. On-board SATA OK A FILO patch is needed (see below) as coreboot is too fast and the disks have not spun up yet when coreboot is done. On-board USB OK Tested: mounting USB storage devices and accessing files on them. USB MIDI-keyboard works, too (keyboard == the music instrument, in this case). On-board Audio OK Use modprobe snd-hda-intel (Alsa). On-board FireWire OK Confirmed working as of r3023 - a firewire disk is detected and works fine. PCI add-on cards OK Works on hardware rev.2. Needs coreboot v2 >= r4362. Please do additional tests on hardware rev.1. PCI Express x1 add-on cards OK Works on hardware rev.2. Needs coreboot v2 >= r4362. Please do additional tests on hardware rev.1. PCI Express x16 add-on cards OK Works on hardware rev.2. Needs coreboot v2 >= r4362. Please do additional tests on hardware rev.1. Floppy Untested Should work, but ***needs testing***. Serial port 1 (COM1) OK Serial console for coreboot and Linux is fully operational. PS/2 keyboard OK Works on Seabios without problems. PC speaker OK Works with beep (use modprobe pcspkr). Sensors / fan control OK Sensors and fans work, see instructions. Some sensor readouts are off, and the pwm polarity seems to be inverted, but fan speed can be set. CPU frequency scaling OK Needs coreboot v2 >= r4364. ACPI OK Needs coreboot v2 >= r4364. Poweroff OK Needs coreboot v2 >= r4364. Nonstandard LEDs OK HD-LED works. Power-LED untested. High precision event timers (HPET) OK Needs coreboot v2 >= r4364. Flashrom OK Use revision 3088 or higher. Flashrom now works on both the PLCC and SOIC/SPI versions of the board. Initial socket CPUs are listed as they work with any factory BIOS version, are likely to work with Coreboot, are affordable, and AMD CPUs are sometimes unlocked in early editions. Also, if you plan to evaluate a series of CPUs, please think about buying a CPU cooler compatible for respectively sockets. CPU: Data used to figure out unique CPU in the CPUID database or factory BIOS supported CPUs. This is useful method to find out the CPU Part number(s) for an already running computer as it is written on the CPU normally blocked by a cooler. Family: With dmidecode: sudo dmidecode -s processor-manufacturer && sudo dmidecode -s processor-family. In CPUID database search Family. Introduction date: In CPUID database search Introduction date. Microarchitecture (CPU family, CPU architecture): In /proc/cpuinfo search cpu family. In CPUID database search Family. Frequency: With dmidecode: sudo dmidecode | grep "Current Speed". In CPUID database search Frequency. Processor name (BIOS) (CPU name string): In /proc/cpuinfo search model name. In CPUID database search Processor name (BIOS) or CPU name string. Socket (CPU socket): With dmidecode: sudo dmidecode | grep Socket. In CPUID database search Socket. Model: In /proc/cpuinfo search model. In CPUID database search Model. Vendor CPU Support List data. Used to alocate the CPU on their list. Stepping (Stepping level, CPU stepping): The term stepping level in the context of CPU architecture is a version/revision number. In Factory BIOS CPU support lists search Stepping. In /proc/cpuinfo search stepping. In CPUID database search Core stepping. TDP (Thermal Design Power, Wattage): In Factory BIOS CPU support lists search Wattage. In CPUID database search Watt. Working overclocked (ACC): Advanced clock calibration (ACC) is a feature originally available for Phenom families of processors, particularly for Black Edition ones, to increase the overclocking potential of the CPU. ACC is supported by the SB710 and the SB750 southbridges, and available through BIOS settings on some motherboards. (Disclaimer - overclocking may damage your CPU. Damage, caused by overclocking, is not covered by CPU warranty.) See AMDGeeks Overclock database for CPUs. The fact that the BIOS is soldered onto the board complicates matters considerably, because it means that one flash of a faulty image will render your board unusable (it will be 'bricked'). Top Hat Flash does not work with the SST 49LF040B 33-4C-NHE soldered onto the GA-M57SLI-S4, but might work with other chips (FWH). This means a hardware hack is necessary to prevent accidental bricking of the board. With it's standard F8 legacy BIOS it requires the noapic boot parameter with most old kernels (legacy BIOS v. F12 is better). If you're going to work on this board, you need a backup plan in the event you flash a faulty BIOS image. For example, the secondary chip must have different size (preferable greater capacity) than the 4 Mbit (512 kB) primary chip (factory chip) in order to avoid accidents: flashrom will not burn the Coreboot image (sudo flashrom -p internal -w Coreboot_4.0-8014-g20c2c4b--Mainboard--Vendor_GIGABYTE._Model_GA-M57SLI-S4._ROM_chip_size_2048KB.rom [...] Error: Image size doesn't match) if the size of the hardware chip mismatch the Coreboot image configured ROM chip size. This is a good thing as it will save you from accidentally burning Cooreboot to the primary chip if you forget to toggle the hardware switch to the secondary chip. Chips with equal size will likely make you break the board one day. You have been warned! If you have a PLCC32 revision, it is possible to desolder the BIOS chip, and replace it with a PLCC socket. You will need some tools (heat gun/pencil, good soldering iron, etc) and soldering experience to do that. The other option is to add a PLCC socket to the empty position next to the soldered-on BIOS chip. With an extra resistor and a switch, this allows switching between 2 BIOS chips. This has been documented carefully by ST; see his instructions. If you don't feel like doing this yourself, you could try to find a commercial service to do it for you. One way to find a shop is to look for game console modification shops, they do this sort of thing (and more advanced things) all day and should be able to help you for around $50 if you bring the needed components (PLCC socket, resistor, wire and switch). Possibly a friendly TV or radio repair shop could help too, but they may not have suitable soldering equipment for the surface mount parts. Once you put a socket on the board, you will also discover that the RD1-PMC4 BiosSavior does not work with this motherboard: the RD1's built-in chip seems to be incompatible with the mainboard. This means you will need to hot-swap BIOS chips until you have a working coreboot chip. Plugging your BIOS chip into the RD1 and switching it to 'ORG' does work though. I have used the BiosSavior to ease hot swapping; it's a lot easier to pull out the BiosSavior and replace the chip plugged into it than to replace the ROM chip on the board. This is the list of BiosSavior resellers: IOSS. In the US, FrozenCPU seems to have stock (verified 2007/04). Eksitdata in Sweden also seems to have stock (verified 2007/03). If you have an SOIC revision, you can add a second SOIC chip in the unpopulated position, and use a switch to toggle between both chips. The most recent instructions by Peter Stuge can be found here . This is the recommended modification. Peter's company also sells pre-modified boards if you don't want to do the soldering, contact peter at stuge dot se for more information. Also, you may watch Peter's video lecture on coreboot available at youtube asf. for recent info. Older instructions can be found here here, and here are some photos. These instructions have been confirmed to work. 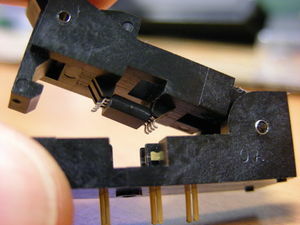 It's also possible to put a SOIC socket on the second pad, as documented by Harald Gutmann, with pictures here and here. Flashrom works fine both under the proprietary BIOS and coreboot. Use revision 3088 or higher. Flashrom works well on the SOIC version of the board and can detect various SPI chips, including the factory soldered MX25L4005. Another possible payload is 'linux-as-a-bootloader' (LAB). You will need a 1MB ROM chip (the GA-M57SLI-S4 comes with a 512KB ROM chip) for this payload. It consists of a (stripped down) kernel + busybox, which can then be used to kexec a kernel from disk. If your disks are playing up, you will still have a busybox environment on boot, which could be useful for debugging. You can build a coreboot image with a kconfig-style configuration tool (buildrom) if you want to use FILO or LAB. This is by far the easiest way to build a ROM image. Continue to the Buildrom section. If you want another payload or would like to get closer to the metal, you can use the manual build method outlined below under Manual build. Skip this section if you want to do a manual build; in that case jump to Manual build below. Configure to your liking. If you use the LAB payload, make sure to exclude the kexec binary and boot menu from the initramfs, otherwise your image will be too big. Please note that currently only the FILO and LAB payloads have been tested. The other payloads likely require some more work before they will be useable. Patches are welcome, of course. If you are building a FILO payload, it will be exactly 512KB in size. If you are building an LAB payload, the image will be 1MB. Skip this section if you use the LAB payload. Note the root device - FILO sees the first SATA device as hd4. Skip this section if you use the FILO payload. This is the kernel that you will be running after boot. It will be kexec'ed by the kernel that is burned into your ROM chip. Adjust the package name as necessary for your distribution. fixes the problem and gives you a static copy of kexec in build/sbin/kexec. The binary will also be considerably larger than its dynamically linked cousin. Note that you must build a 32-bit version of kexec, because buildrom puts a 32 bit kernel into the ROM image. A 32-bit kexec can kexec into a 64 bit kernel, so if your system is 64 bit this will work just fine. The LAB code currently expects lab.conf and kexec to live in / on /dev/sda1. Skip this section if you used buildrom; in that case jump to Burning coreboot below. This will make FILO wait 5 seconds before probing the disks, making sure that the SATA disk is ready. Also, the GA-M57SLI-S4 will not boot unless you add acpi_use_timer_override as a kernel option - and use a modern kernel (tested on 2.6.20.1 and up). Hopefully this will be fixed in newer kernels. If you have a somewhat older kernel (tested with 2.6.16 and up), add these options: apic=debug acpi_dbg_level=0xffffffff pci=noacpi,routeirq snd-hda-intel.enable_msi=1. 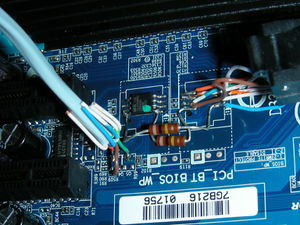 Make SURE that you have a fallback position: a ROM chip with backup copy of your factory ROM image (you can make one with flashrom), and either a socket on the board to plug the backup chip into, or the tools and skills to remove a 'bricked' BIOS chip from the board and replace it with a socket for the backup chip. If you do not prepare properly, you are likely to brick your motherboard. You have been warned! (that's assuming the image is called coreboot.rom). See EHCI Debug Port for USB debug hardwares that you need to use with the USB debug port. sudo lshw # gives one result for EHCI capable USB port. 10de:036d is found on the list of controllers verified to have the debug port capability so we know that it is working. The upper-right USB port seems to be only one USB EHCI debug port of the 4 available USB ports on the board. Plug a USB flash memory in the upper-right USB port. As of >=r4362 all PCI and PCI-E slots should be initialized correct and work fine. 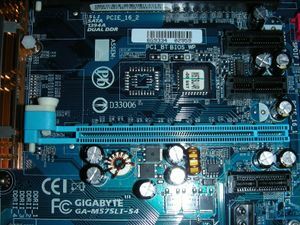 In fact either one PCI or one PCI-E must work if you want to be able to use a screen via AGP, as there are no on-board VGA for this mainboard. For hardware rev.1 it would be nice to get further test results. to your "Device" section. Update (14.9.2009): Is this a v1 specific problem? Is this problem maybe fixed with the IRQ-Fix patch? If you can help out with these issues, please join the mailing list and let us know! This page was last modified on 30 August 2017, at 08:37.